Bird-in-Hand Fire Company purchased 18 new self-contained breathing apparatus (SCBA) at the beginning of 2016. These new air packs replace the ones that had been in use since 1999. The back of every seat on the firefighting apparatus contains an air pack that the firefighters slip into as they head to a fire. The packs fit like a backpack. Both the backpack and the face mask in the new models are more comfortable with better padding and weight distribution. With the air cylinder on his back, a firefighter uses the mask anytime he enters a burning building or encounters a hazmat situation, excessive smoke, and toxic fumes. The new air packs have a heads up display (HUD) in the mask that shows the amount of air left in the air cylinder. Plus the special connection on the back is universal across all brands and can be used by any Rapid Intervention Team (RIT) to resupply air when a firefighter is in trouble. Bird-in-Hand received a grant in the amount of $48,735 from the Federal Emergency Management Agency (FEMA) through their Assistance to Firefighters Grant Program (AFG). The total price for the air packs was $122,000. 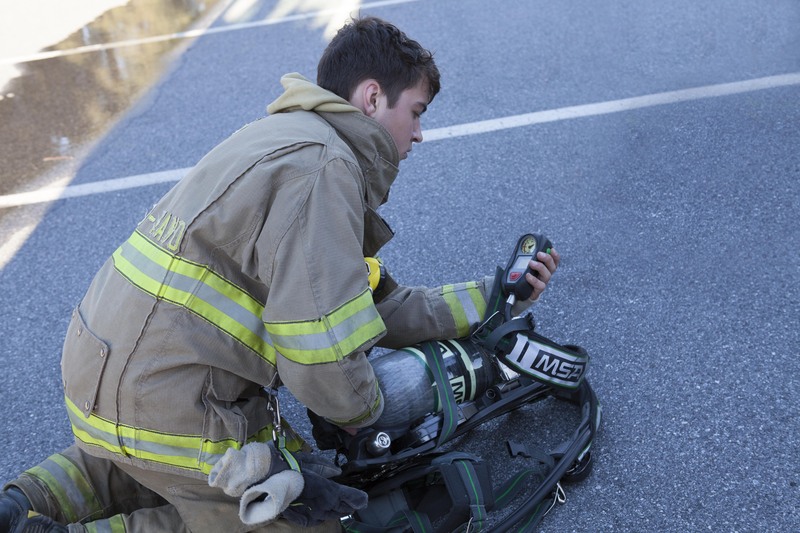 Junior Firefighter Arlan Miller checks a gauge on his new air pack. The cylinders are industry standard with 4500 psi.